Falls Filtration has engineered a self-operating type oil bath filter, which provides extremely low-pressure loss and does not require use of any external power for oil handling.The type LP Oil Bath Filter is a second-generation design, which operates at a low-pressure loss and a wide range of airflow capacities (see Flow Capacity and Pressure Drop Chart, next page).No other filtration method affords such high filtration efficiency combined with the added features of extended operation without attention, small space requirements, and overall economy. Oil Scrubbing is a universally accepted method of cleaning intake air but a serious deterrent has been the relatively high-pressure loss across the filter. The Falls Filtration LP Oil Bath Filter eliminates this problem because it is self-operating and does not require moving oiled curtains or motor driven oil pump arrangements. Can be serviced while operating. Falls Filtration LP Oil Bath Filters are recommended for cleaning intake air of engines, compressors, and blowers. Dirt laden air enters under weather hood a (A) and trough a trash screen (B). Under normal airflow conditions, approximately 2% of the air passes across the oil control pan (C) and beneath the air deflector skirt (D) where it lifts oil droplets from the oil control ports (E) and carries the oil into the scrubbing chamber (F). The balance of the air passes directly upward through ports (G) arranged peripherally around the bottom or the scrubbing chamber where it is directly tangentially by flexible port covers (H). This forms a rotating air mass that is thoroughly scrubbed by the oil present. Deflector plates (J) intercept most of the dirty oil droplets and guide them to the center oil return tube (K), which drains oil and dirt into the sump (L). 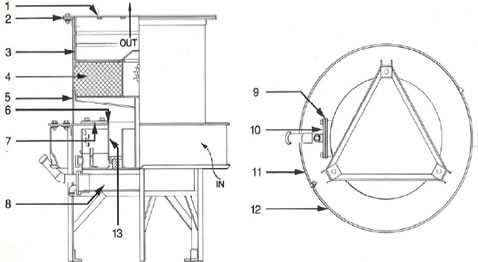 Sufficient oil is carried into the metal mesh filter-separator element (M) to provide adequate adhesive properties. This maintains high filtering efficiency on fine dirt particles and continually flushed collected dirt from the element. The dirty oil also returns to the sump through the oil return tube. PRESSURE DROP IN INCHES W.G. Falls Filtration LP Oil Bath Filters offer highly efficient dust arrestment. Efficiencies vary depending on type of dust and test procedures used: up to 98% using Standard Air Cleaner test dust. 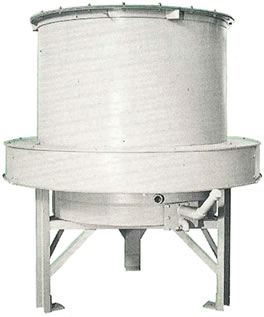 The unusually large reservoir for extra dirt holding capacity, plus its low pressure loss, gives the LP Oil Bath Filter a unique advantage in protecting air-using equipment from dirt contaminate. Readily accessible drain connection, easy rain hood disassembly, and conveniently located sump cleanout doors facilitate servicing. Sump can be cleaned while the unit is in operation. If necessary, the element can be removed from the top. A sight gauge permits observation of oil levels when the equipment is shut down. * To complete cover plate S/A number add outlet size, I.e. LP40 with a 20" outlet is LP40-20-100Consult Factory for replacement parts for models LP90, LP100 and LP110.